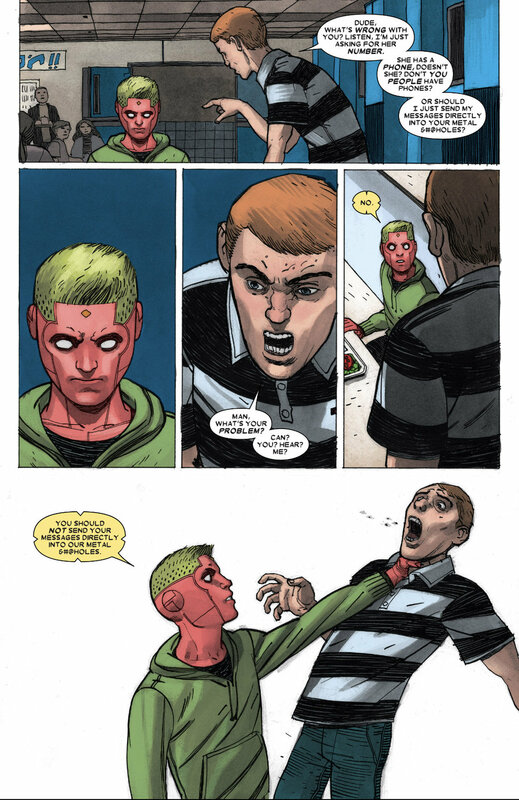 Just read: 'The Vision: Little Worse Than A Man, Little Better Than A Beast' by Tom King — Sorry, Internet. A blog by Thomas Nassiff. A blog about music, sports, tech & other things by Thomas Nassiff. Just read is a blog where I blog about something I just read. Here are all of the entries. And here are all of the entries specifically about comic books. Tom King's run writing The Vision for Marvel Comics lasted only 12 issues, collected into two trade paperbacks, but it made a mark in terms of critical and fan acclaim. After hearing enough about it online, I purchased both trade paperbacks -- the first six issues are collected in Little Worse Than A Man, while the back six are collected in Little Better Than A Beast -- during a big Marvel sale on comiXology last year, and I finally got around to reading them when it became a topic during a recent Do By Friday episode. King enjoyed such positive acclaim with The Vision, along with previous successes, that he ultimately parlayed it into an exclusive contract with DC, where he's currently roughly halfway through a 100-issue run as the writer of Batman. Not a bad gig to jump to following a project that nobody had particularly high expectations for; The Vision was announced right around the time the character was playing a large role on-screen in The Avengers: Age of Ultron, so King's run could have easily been a quick, heavy-hitting action story to expand a bit on the history of Marvel's best-known A.I. character. No one would have blamed King and Marvel for going that route, or for taking Vision on a short journey that followed the events of Ultron. Instead, King wrote an arc that features Vision creating a family for himself -- a synthezoid wife (Virginia), and two twin synthezoid kids (Viv and Vin) -- and moving just outside Washington, D.C., to live in a normal suburban home. It's a great setting for a storyline, and the backdrop is enhanced by King's portrayal of The Visions' difficulty in settling into everyday life. Vision loads his new family up with memories of normal human behavior, and apparently expects them to get along with the neighbors just fine. Throughout Little Worse Than A Man, he's busy conducting Avengers business as the superhero team's official liaison to the president. But the family struggles to be "normal" in any way as people naturally tend to treat them differently; King's writing of the Visions as the "others" in the neighborhood is well-paced by a constant narrative voice that accompanies various scenes, sometimes spoiling future events for the reader in a foreboding, ominous way. During one of his absences, Vision's family is attacked by Grim Reaper, who gravely injures Viv. To protect herself and her children, Virginia retaliates a bit too harshly and winds up killing the villain. She buries the body to keep the truth from her husband, but her actions are caught on video and she is blackmailed by the unknown owner of the footage. 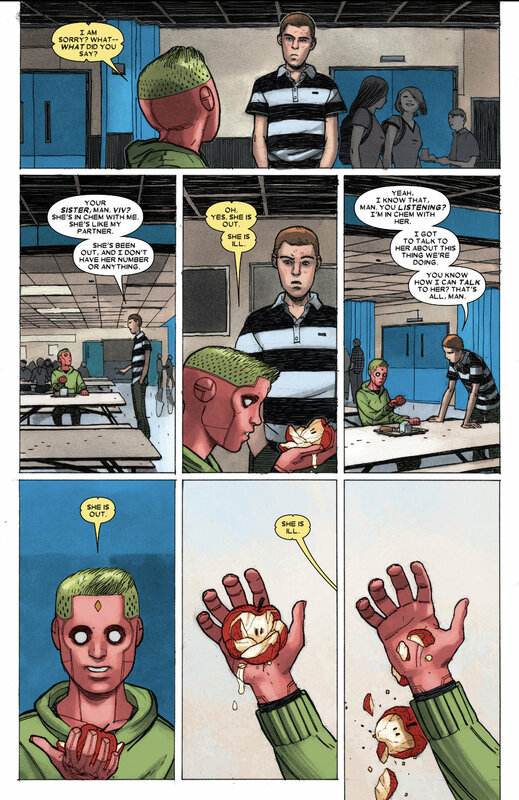 Another trip home for Vision involves him dealing with an issue at school with his son, who nearly kills another student when he is aggressively questioned about the absence of his sister while she is recovering from her injuries (screenshots below). The boy survives, and winds up sharing a nice moment with Viv once she does return to classes, providing Viv with one of the only pleasant interactions she will share with a classmate. Her and Vin are largely feared or misunderstood by others students, and Viv recalls the memory with this boy regularly, replaying it from her memory bank when she feels lonely. The story progresses as Virginia is called to action by the unknown owner of that footage; it turns out to be the father of the boy Vin nearly choked to death. He wants to force the Visions to leave town, and feels threatened when Virginia refuses. He pulls out a gun and attempts to shoot her, but Virginia phases and the bullet goes through her, hitting and killing the man's son, who was watching the interaction play out unbeknownst to his father. This tragedy affects Viv greatly, as the boy was kind to her, but also affects the family in a larger way as Vision is called into a detective's office and is asked to recount his whereabouts on the evening of the boy's death. Vision says he was at home with his children, and lies to cover his wife's unknown location by saying she was home with them. All of these events happen in the course of Little Worse Than A Man, and the story only grows more intense, emotional and complex during Little Better Than A Beast. At the end of the first collection, Vision discovers the Grim Reaper's body buried in his backyard, and makes the ultimate choice that he must help his wife keep this secret to continue living as close to a normal life as possible. Individual mistakes, actions and choices by each of the four Visions wind up creating an untenable situation, but Vision is driven to make things work, nearly to the point of madness. 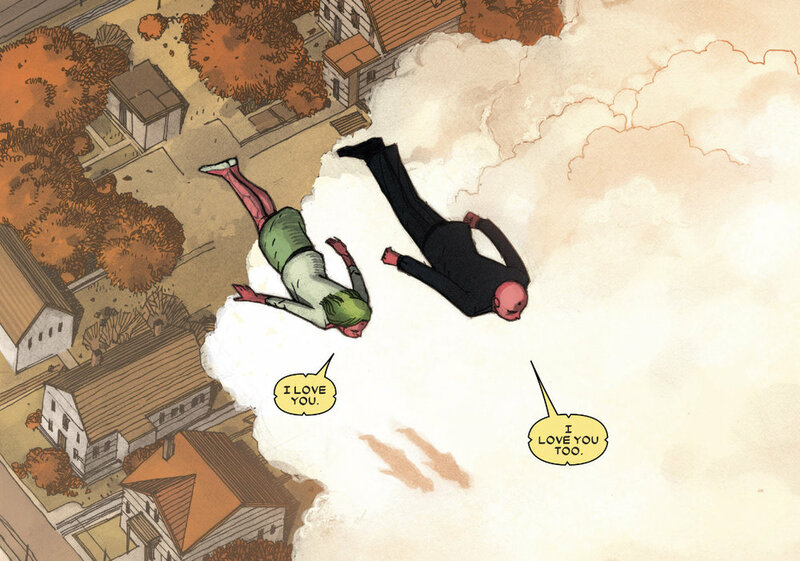 That sentiment -- Vision wanting to keep his family safe, wanting to keep their experiment in the suburbs alive -- turns out to be the theme that pushes us onward through the story. Vision will do almost anything to protect his family, and to keep up the illusion of their normal life. It's a misguided attempt by the hero to provide himself with a group of people he can connect to; as we learn, this great desire is spurred by the falling out of his romantic relationship with Wanda Maximoff, the Scarlet Witch. Mistakes made by Vision's family force him to lie for them, and even harm his friends, as he attempts to protect them. We get a first-hand look at how powerful Vision is in combat during one scene when he takes on effectively every single Avenger at once. 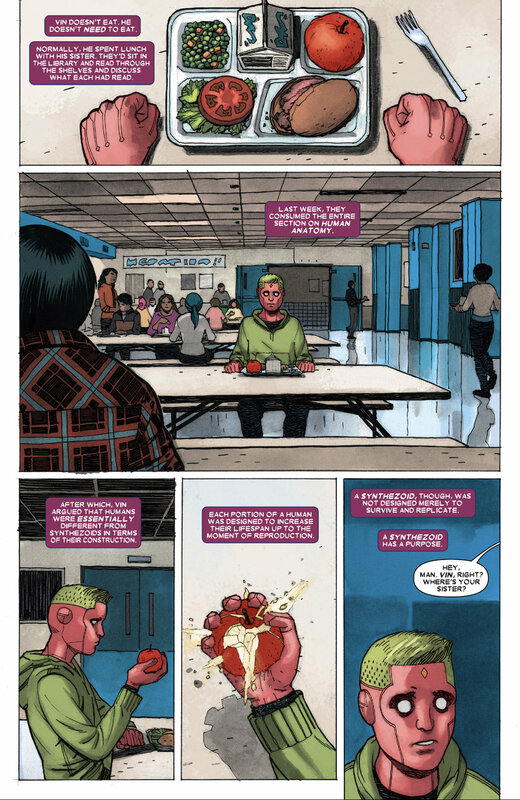 These choices are tragic in that they're probably the wrong choices, but also tragic in the sense of what it tells us about Vision -- that there's some deep-seated desire for connection within this character that he is hell-bent on fulfilling even if it hurts others. At the end of Little Better Than A Beast, both Vision's son and wife are dead. We see Vision saying goodbye to his daughter as she leaves for school in a scene that implies they might be moving forward, that Vision might be coping with his new situation. But as Vision heads back into his home, we see him operating on Virginia, attempting to bring her back to life. It's a bittersweet ending, knowing Vision's drive for a family is still totally consuming him. This run of The Vision is unexpectedly gut-wrenching and thought-provoking; it's a story for people who like good storytelling, with some superhero stuff happening as a backdrop. It'll probably merit a future re-read to better understand the overall themes. And although I was left wanting to spend more time with this tragic character, to see whether he would grow past his obsession, it's also nice to have a compact storyline that can be easily shared with fellow comic book lovers. Little Worse Than A Man and Little Better Than A Beast are available on Amazon in physical formats at those respective links. They're also on Comixology if you wanna go digital. Clicking on and purchasing from Amazon links on this blog provides a small kickback to the author.